We, the citizens of Ontario have had enough of the OPP not laying charges or following through on investigations of the Ontario Liberal Government dating back to 2003 to present date, as there seems to be a NEW ONE daily! 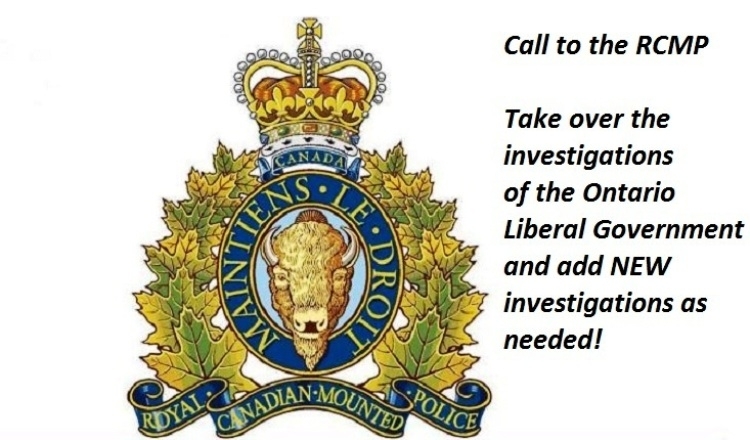 We are tired of it and demand that the RCMP take over the Investigations now and not wait another minute. Watching daily the Legislative Assembly and the Amethyst Room Committee is PAINFUL to say the least. It results in nothing but more lies, hidden costs, and corruption PLAIN AND SIMPLE! It is a slap in Ontarians faces that they, as of today, June 18, 2016 are YET again not going to be held accountable for MISSING HARDDRIVES from the PANAM games. Enough is Enough! Let's get right to the root of all the problems and whom the Liberals are dealing with. Many know, but their hands are tied by Liberalism Media that will not give them the time of day! We are tired of seeing Kathleen Wynne and her ENTIRE Party laugh in the faces of Ontarians daily just like her predecessor Dalton McGuinty did. Bring him back and all of the past Ministers who tucked tail and ran. All the outside players, consultants, boards, Directors, etc. Do a thorough investigation on every Liberal since 2003 and charge them as they should have been as far back as 2003. Dalton McGuinty and all PAST and PRESENT should be investigated not only for their ties with Unions but with Mafia! They are not squeaky clean to say the least, and after 250+ scandals (which I like to label them CRIMES - too which they REALLY are) should all be charged and in a real court of law and certainly not running our Province! The Charbonneau Commission in QC in the corruption in the Construction Industry, but if the TRUTH BE KNOWN, it is in everything the Liberals touch and every industry. I followed that entire trial and McGuinty and all Liberals should be investigated the same way it was in QC for those crimes. The first day it was let out that Ontario was fully loaded with Mafia. Dalton McGuinty DENIED it. After many people hounded him he prorogued and QUIT. McGUILTY! They are happening here and have been since McGuinty came to be in 2003 and continue to happen under his MINI ME Kathleen Wynne and all Liberal Ministers. It is apparent that we need Intervention of the RCMP because we are not getting anywhere in Ontario with the Liberal Government, nor are we given any answers! OPP instead get a raise increase when a Wage freeze is in effect and all the while investigating the Liberals! They intervened in the elections process also and that was a direct Conflict of Interest. We SANE Ontarians cannot take any Liberal seriously when they utter the words they want Accountability, Trust, Honesty, Truth and Transparency even as of today's date. THAT went out the window in 2003 the minute Dalton McGuinty took the stage. We implore that Kathleen Wynne call in the RCMP to take over the investigations from the OPP and IF SHE REFUSES Ontarians who are signing this IMPLORE the RCMP step in A.S.A.P! It is THE RIGHT TIME to do so! We, the undersigned, call for Kathleen Wynne to call upon the RCMP to takeover the ongoing investigations on the Ontario Liberal Government. If she refuses to do so, Ontarians want the RCMP to step in and do a thorough investigation on all their dealings since 2003. It is apparent we will get no answers without this step being taken as the OPP seem to not be doing their jobs on our Tax dollars that pay for them to PROTECT US. We, the undersigned understand that Kathleen Wynne could ask for the RCMP to look into all the scandals (which are all crimes) too which I am sure she will NOT DO as that would totally 'out' the Liberals! We, Ontarians, want the RCMP to look into all the corruption not only with the Liberal party, but that of the Mafia and Unions involvement in every Industry in Ontario including the Public Sector they have infiltrated. A simple phone call to the RCMP asking them to take over, but she won't do it to protect herself and her party. Narcissism! We, the undersigned, the citizens of Ontario, deserve answers and we feel the only way to get them is to have the RCMP to takeover the cases. Do a thorough investigation of anything and everything they have touched since 2003 to present date! We, the undersigned demand that Kathleen Wynne call in the RCMP in to take over the investigations or RESIGN IMMEDIATELY! If, she RESIGNS, we demand that the RCMP get involved and give us the answers that we will NEVER get from Kathleen Wynne and her Liberals, nor will we get them from the OPP! The Call to the RCMP to take over Ontario Liberals Investigations if Kathleen Wynne won't call you in petition to RCMP and Kathleen Wynne was written by Fighting for our Rights and is in the category Government at GoPetition.